I’m not a vegetarian although sometimes I do naturally gravitate towards a meat-free day. I eat chicken, beef, and pork with the occasional seafood and pretty much don’t go outside of that list. I’m also someone who really needs my protein to have an abstract quality – I don’t do well with being served a dish that still has eyeballs, for example. And while I require (as much as possible) that the source was free-range, organic, pastured, and treated as humanely as possible, I prefer not to know other process details. That said, the full Irish breakfast was a bit of a challenge for me when it was time to try the black pudding. I recently saw a segment on the Food Network on exactly how black pudding, sometimes called blood sausage, is made. I completely understand that it’s a matter of what one is used to eating, and that for many countries black pudding isn’t something to be squeamish about, but before my trip to Ireland I had never consumed anything with pig’s blood as the main ingredient. 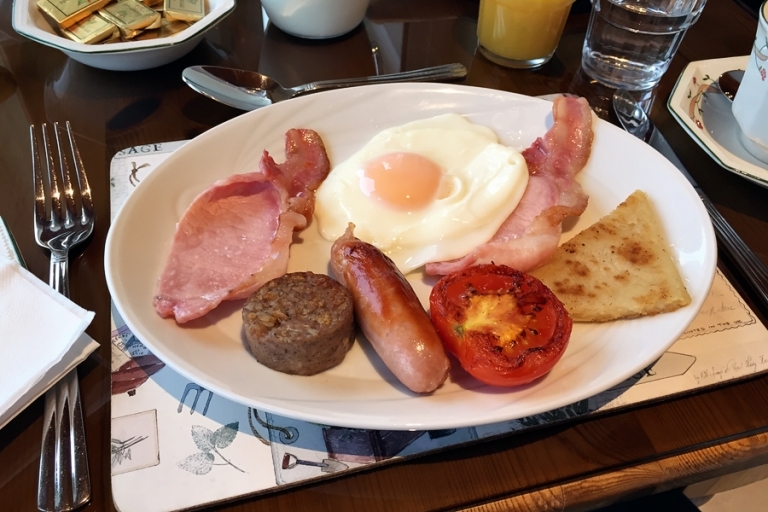 I promised myself I’d experience the full Irish breakfast though, and I ate it! I actually ate it twice – the first time I forgot to take a photo (darn it! ), so I ordered the dish again at the The Arches Country House where Noreen served us this gorgeous meal. Okay, technically both times I gave half of the pudding to Chris, but I still think it counts. If you’re wondering whether or not I am now a fan of black pudding, um…no. I still can’t get past the ingredients, but it was a huge step for me to try it! I’m not usually good about trying new foods, but I’m pushing myself to get out of my comfort zone (within reason). And in case you can’t tell from the photo, the rest of the breakfast was fantastic.